How interesting! Never new you can bring it back to life! Hi Lauren! Great blog you got here! Thanks for pointing it out. I'll be adding you to my google reader list. Hi Lauren, I came across your blog and I have to say, I find it very interesting and inspiring! 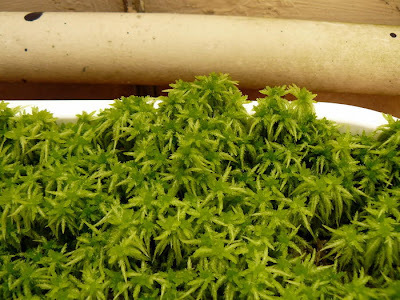 I also have a suggestion how to revive Sphagnum moss. Fill a bucket, sink etc., with warm water and just dunk it. The wonderful thing about Sphagnum moss is that it gets it's colour and freshness back quite quickly after being dunked in warm water! As a florist I have dealt quite a few times with dry Sphagnum when I needed it nice and moist! But some warm water can do miracles! What are the lighting needs for reviving a dried moss and once its revived? Also I once read about soaking few of the spore heads and sprinkling them. Do you know how to go about it? Thank you. This is a great question archana! I am going to review some resources and post a reply to your question shortly. I don't know anything about moss. I ordered some live sphagum moss from Amazon and it came dried in a plastic bag. I'm not sure what I should do with it. Do I need to soak it in water? And what should I plant it in? I'm confused! Hi Beth - it really depends on what you are using the moss for! Are you trying to grow living moss in a terrarium with the sphagnum moss or use it as a filtering layer in your terrarium? I'm wondering if you only want to moisten the dried moss without any soil, or does it green up then you transfer to soil? Good question Paula! The moss can revive when planted in soil, but it can take a few weeks. Also, it will start sprouting new little legs of moss, rather than reviving the part you started with. So how much light should the moss be in? I've always heard high light and humidity. It often revives on carnivorous plants like Venus fly traps and sarracenia, which love full sun. I would try it in a plastic container to hold humidity and place it somewhere sunny. Not sure about having a lid on the container though, because you want air flow and it to not bake. I bought a batch of dried moss recently and still have half the package. Thinking about trying to see if I can get spores to sprout in it.